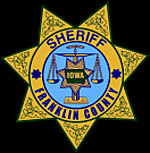 The Franklin County Sheriff’s Office says Sheriff Linn Larson has died. The Sheriff’s Office announced in a news release that Larson died Tuesday following an illness, he was 59. Larson started his career in April of 1978 as a police officer in Belmond. He moved through the ranks and became police chief in 1983. Larson joined the Franklin County Sheriff’s Department in August of 2006 and was promoted to Chief Deputy in 2008. Larson was elected Sheriff in 2016. Larson served as the commander of the North Central Iowa Narcotics Task Force Special Operations Group for nearly six years. The funeral arrangments have been set. Visitation will be 4 to 8 p.m. Thursday at Church of the Living Word in Hampton, and services will be 1 p.m. Friday at the church.